One World Symphony has begun a love affair with Richard Strauss by performing the revolutionary Salomé in 2007, with full orchestra. 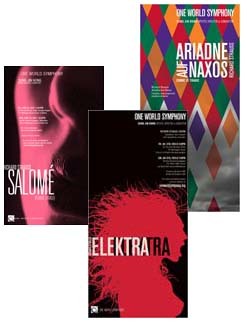 The 2007/2008 season closed with his sublime Ariadne auf Naxos To celebrate the 100th anniversary of the debut performance of the daring music drama Elektra, One World Symphony offered New York audiences an opportunity to hear Elektra on the exact anniversary of its world premiere on January 25, 2009. In 2010/2011 season, One World Symphony performed his last great work Four Last Songs. Join us at each stage of our adventure.